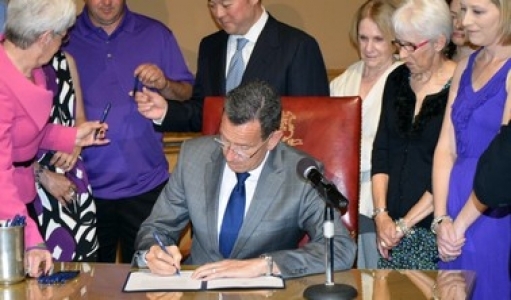 Governor Dannel P. Malloy has signed into law a legislative proposal he introduced earlier this year that is designed to protect the victims of domestic violence by prohibiting the possession of firearms for anyone who becomes subject to a temporary restraining order. The period of time immediately following a domestic violence survivor's application for a restraining order is one of the most volatile, and access to a firearm presents an additional threat. "This new law will help protect survivors of domestic violence during a vulnerable period - and it will save lives," Governor Malloy said. "We have a moral obligation to work to prevent needless tragedy. Now, Connecticut is taking a commonsense step towards providing increased protections for domestic violence survivors. I'd like to thank the bipartisan group of members in the state legislature who voted to approve this legislation, in addition to the strong advocacy of Lieutenant Governor Wyman and all of the supporters who helped get this bill to my desk so that I could sign it into law." Between 2000 and 2012, Connecticut averaged 14 intimate partner homicides per year, and firearms were the most commonly used weapons. Similar to laws that are already enacted in over twenty states across the country - including Massachusetts, Texas, Utah and New York - this new state statute recognizes that the hours immediately following the filing of a court order are among the most dangerous, and closes a critical loophole to protect those at risk. "Domestic violence is a complex issue, but this legislation has one simple goal: to save lives," Lt. Governor Nancy Wyman said. "I commend the Governor's leadership in proposing this legislation, the work the General Assembly did to get it over the finish line, and the perseverance of all of our partners. This law strengthens public safety, and it speaks to our commitment to help victims and their families." Under prior state law, once a temporary restraining order had been issued, a hearing was required to occur before a judge could issue a permanent restraining order and prohibit firearm possession. These hearings would often happen several days to weeks after the temporary restraining order had been issued, creating a critical gap of time. This new law will make a person temporarily ineligible to possess firearms shortly after a judge issues a temporary restraining order, pending a hearing in court, giving victims additional protection. "I'm gratified that the advocates were so persistent in their insistence on the passage of this bill. It probably took two years longer than it should have," State Senator Eric Coleman (D-Bloomfield), Senate Chairman of the Judiciary Committee, said. "Given all the data that we have about domestic violence incidents and what can happen when there is a gun available to a domestic abuser, this bill is just common sense. This new law will make women safer in their relationships, and will reduce the number of lives in jeopardy and the number of lives that are lost." "The purpose of this law is simple - to make sure that a woman who leaves her abuser is not shot or murdered," State Representative William Tong (D-Stamford, Darien), House Chairman of the Judiciary Committee, said. "This is commonsense legislation. In the past decade, more than 100,000 people have died as a result of gun violence across the nation. There are some who would say that their Second Amendment rights are being taken away, but the truth is the gun in fact can always be returned later to the rightful owner. What can't be returned is the life that has been taken from a victim." Karen Jarmoc, chief executive officer of Connecticut Coalition Against Domestic Violence, applauded the signing of the bill, stating, "This is a commonsense law that will help protect victims of domestic violence at the most dangerous time, potentially preventing fatal violence when victims take the first step to end an abusive relationship. We thank Governor Malloy, Lt. Governor Wyman, and the General Assembly for their support of this important, life-saving measure." The legislation - Public Act 16-34, An Act Protecting Victims of Domestic Violence - received bipartisan support in the House and the Senate, and was backed by advocates against domestic violence, crime victim support groups, as well as police chiefs from throughout the state.